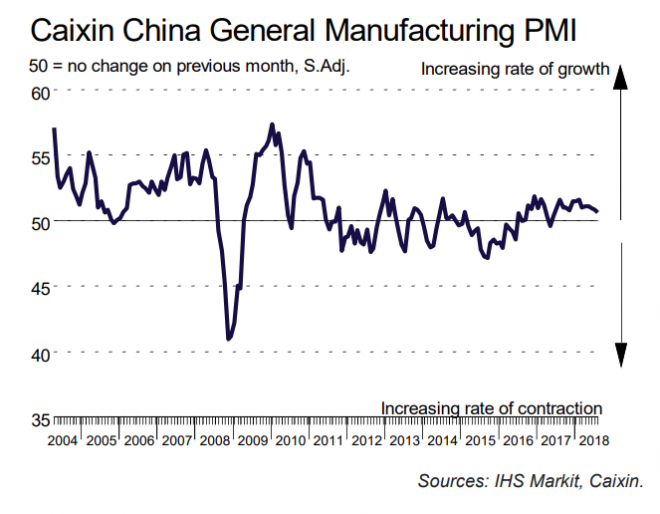 August survey data signalled a further improvement in Chinese manufacturing operating conditions. Output continued to expand, and at a quicker pace than in July. However, new orders rose at the slowest rate since May 2017, while export sales declined for the fifth month in a row. At the same time, employment remained on a downward trend which, in turn, contributed to an increase in outstanding workloads. Inflationary pressures meanwhile picked up, with firms noting steeper increases in both input costs and output charges. Confidence towards future output remained stuck near June’s six-month low, with a number of panellists citing concerns over the impact of the ongoing China-US trade war and relatively subdued market conditions. The headline seasonally adjusted Purchasing Managers’ Index™ (PMI™) – a composite indicator designed to provide a single-figure snapshot of operating conditions in the manufacturing economy – posted above the neutral 50.0 level at 50.6 in August. However, this was down from 50.8 in July and signalled the weakest improvement in the health of the sector since June 2017. Manufacturing production continued to increase during August, and at the fastest rate since the start of the year. However, latest data indicated that demand conditions softened, with total new business rising at the slowest pace for 15 months. Weaker foreign demand contributed to the softer increase in overall new work, with export sales declining for the fifth month in a row. Reports of company restructuring and cost-cutting initiatives underpinned a further reduction in headcounts at Chinese manufacturers in August. The rate of job shedding picked up from July but remained moderate overall. At the same time, backlogs of work rose for the thirtieth month in a row. Manufacturers continued to expand their buying activity in August. That said, the rate of growth was modest and below the series average. Stocks of purchases meanwhile rose only slightly, which in part reflected a more cautious approach to inventory holdings. Notably, stocks of finished items fell for the fourth month in a row. Average supplier performance continued to deteriorate in August, with some panellists linking longer lead times to stricter environmental policies. However, the rate at which delivery times lengthened was the slowest for six months. Input costs increased at an accelerated rate in August, with the rate of inflation the second-sharpest in seven months. According to panellists, higher raw material costs drove the latest upturn in purchasing prices. As a result, average charges for manufactured goods rose further, with the rate of inflation also quickening since July. Optimism regarding future production remained relatively subdued in August, with confidence little-changed from June’s recent low. Positive forecasts were generally linked to expectations of rising client demand. However, concerns over the ongoing China-US trade war and softer demand conditions weighed on overall sentiment. What the US – China trade war is doing to China is the same as the US sanctions have done to Russia…..forcing them to do the things they would never have done if left to drift……..this is good for China in the long run. God, I wish they would sanction Australia and force us back onto our own resources.